At 10 stories high, Faith Haven is a recognizable landmark in its West Duluth neighborhood. 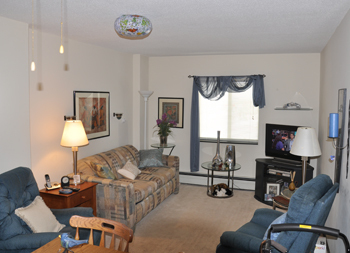 Inside its walls, Faith Haven offers 124 units of independent living apartments building for seniors aged 62 and older. The building is of full concrete construction with 2 elevators serving all 10 floors plus the lower floor community room and laundry level. The apartments offer 400 square feet of living space including one bedroom, a bathroom with combination tub and shower, living room and furnished kitchens with refrigerator and stove. All apartment floors are vinyl tile allowing the resident to carpet the apartment as they wish. Apartments have dual exhaust air systems allowing a continuous flow of fresh treated air. The apartments are heated with an individually controlled hot water radiation system.The units are cable ready for tennants wishing to subscribe to local cable television service. The building is fully handi-cap accessible. The hallways are a full 5 feet wide and equipped with sturdy handrails. The hallways are beautifully carpeted and decorated with the apartment house keeping program assuring that the hallways are always clean and orderly. © 2013 Faith Haven Apartments. All rights reserved.